I searched all around to try to find out if the side impact cushions on the Britax Advocate 70 CS child car seat are removable. I couldn’t find anything, so I went ahead and looked. It turns out that each cushion is held on with 3 Torx screws that are located on the inside of the seat underneath the cover and foam. I guess this is not widely touted, because people buy this car seat specifically for those cushions and probably don’t typically want to remove them. For us, we wanted to remove them, because we’re going on a plane tomorrow and we don’t want those side cushions taking up extra space. Fortunately, they’re easy to remove. 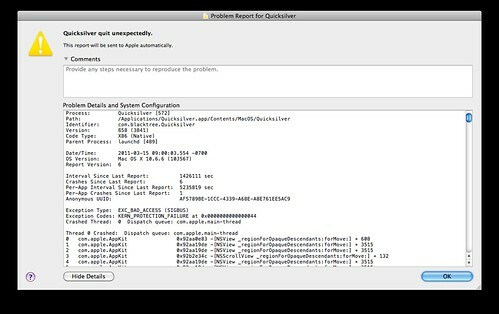 I wasn’t even using Quicksilver when this crash report popped up. Here’s the text of the crash dump. This computer has been having a lot of kernel panics and crashing processes lately. I fear that it could be on the way out. Can anyone recommend a program for checking the RAM (and possibly other components of a Mac)? On Windows, a number of years ago, I used Sandra – is there something comparable for the Mac? A follow-up of sorts to my earlier post on Canon MP560 and Snow Leopard troubles. CIJScannerRegist almost undoubtedly refers to /Library/Image Capture/Support/LegacyDeviceDiscoveryHelpers/CIJScannerRegister.app which is almost undoubtedly something that was installed on the system by one of the numerous Canon software packages that I’ve installed for scanning support. I am going to check to see if I have the latest stuff that Canon has available on their support site. Maybe this crash and the other problems I’ve had are fixed by a software update which I don’t have yet. If not, then I fear that Canon has some problems in their drivers. I sent them this crash report too. I figure that if I am using the old version of their drivers, they will probably be able to tell and they will tell me to upgrade my software. If I’m using the latest software, then hopefully they will enter this as a bug into their system and hopefully can get something useful out of the crash report for fixing it. I don’t know if it’s the hardware or the software or both, but this printer/scanner has been fairly irritating with Snow Leopard. I’m quite disappointed, because I’ve had a lot of Canon printers and they have always been great. This one is great in many respects, but the networking works really badly for us. Sometimes when we try to print it works fine and sometimes OS X reports a “communication error”. Sometimes pausing and resuming the printer seems to get things working. Sometimes it doesn’t. Sometimes rebooting the printer and/or the computer does the trick. Even when this “communication error” occurs, I can still ping the printer, which tends to refute my earlier theory that the problem was the wireless network. This leads me to think the wireless network is working fine and something wonky is happening with the printer and/or the drivers. Sometimes when I’m having problem like the above, I press the button to turn the printer off and it churns away doing its “power off dance of lights” for several minutes until I lose patience and pull the power cord. This really seems like a fairly serious hardware problem. Sometimes when attempting to scan from the panel of the printer, it shows the computer as a destination; sometimes it does not. Rebooting the printer and/or the router sometimes seems to help. Sometimes when attempting to scan from the panel of the printer and it actually shows the computer as a destination, it just doesn’t work. I select the computer as the destination, the printer thinks for a while, and then it asks again for a destination. The MP Navigator EX software is fairly annoying and un-Mac-like. As far as I can tell when you scan from the panel of the printer and send it to a computer, the filename always defaults to “IMG.jpg” or “IMG.pdf”. Renaming the file is pretty easy, but it’s somewhat tedious to look at the document to see what it is, because when you double-click it, rather than opening up in Preview.app, it opens a small MP Navigator EX window and it’s tedious to navigate in. It seems that if you use Finder to manually rename files that are in the MP Navigator EX directories, MP Navigator EX gets very confused, so you have to do the renaming in MP Navigator EX. When you look at the Canon support site to download drivers, it is incredibly confusing, because you pick OS X as the platform but not a particular version of OS X and you don’t pick your language. So you look at a long list of a lot of different confusing software packages for various versions of OS X and with English and Spanish mixed together. For some reason, there seems to be an almost ridiculous number of software packages and I’m still not really clear on which ones are needed for what — e.g. : the scanner driver, the ICA driver, the CUPS driver, the MP driver, Solution Menu, IJ Network Tool, Wireless Setup Assistant, IJ Setup Repair Tool, MP Navigator EX, and MP Navigator EX Opener. A few minutes ago I tried to print something and the printer queue window has been stuck saying “Copying print data…” for several minutes now. Is it just me or does this printer not work particularly reliably with Snow Leopard? While playing with some OmniFocus AppleScripts last night, I realized that OmniFocus on the Mac uses a sqlite database (in addition to the zipped .xml files that it uses for synching). This is pretty interesting, because it could be a very convenient way to write tools that interact with OmniFocus (and use something like Python instead of AppleScript). Pretty cool. With a little Python and SQLAlchemy, I could probably create a nice little Python module for dealing with OmniFocus data. I rely on OmniFocus (both the Mac and iPhone versions) to maintain some semblance of order in my life. I occasionally think of ideas for scripts to make OmniFocus for Mac fit better with my workflow, but I seldom have the time to actually sit down and write them, especially since I’m not particularly strong with AppleScript. I have a few OmniFocus AppleScripts installed (the main one I use is “Complete and Await Reply”), but I often think that I’m just scratching the surface of what’s possible. So I was very glad tonight to stumble upon Sven Fechner’s excellent post, Top 5 OmniFocus Applescripts, which covers 5 particularly helpful AppleScripts. The only one that I’ve tried so far is the one that Sven calls “Quickly find a project” (the script itself is called FindProject07.scpt if you download it), but that alone was an awesome find for me as navigating quickly to a project with the keyboard is so much faster than mousing and scrolling for me.